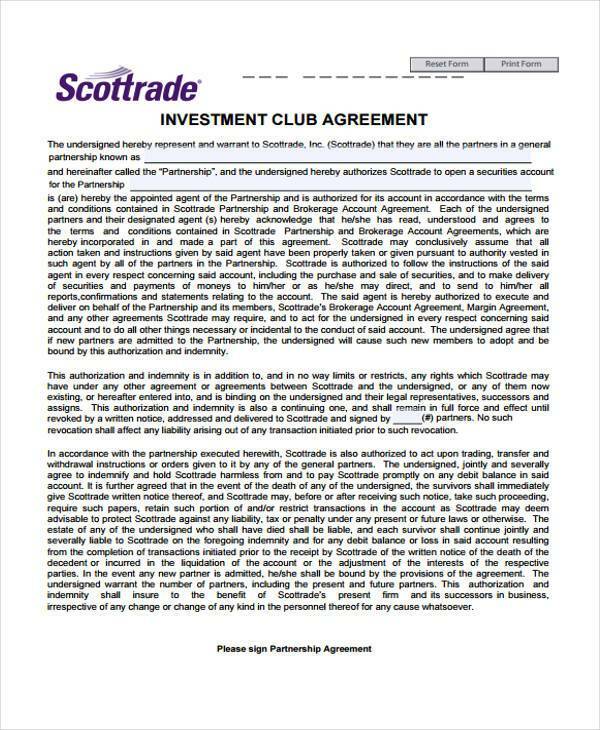 An investment club is an organization consisting of a group of people sharing the same interest in pooling their money together for investments. This can be sometimes referred to as a business partnership. 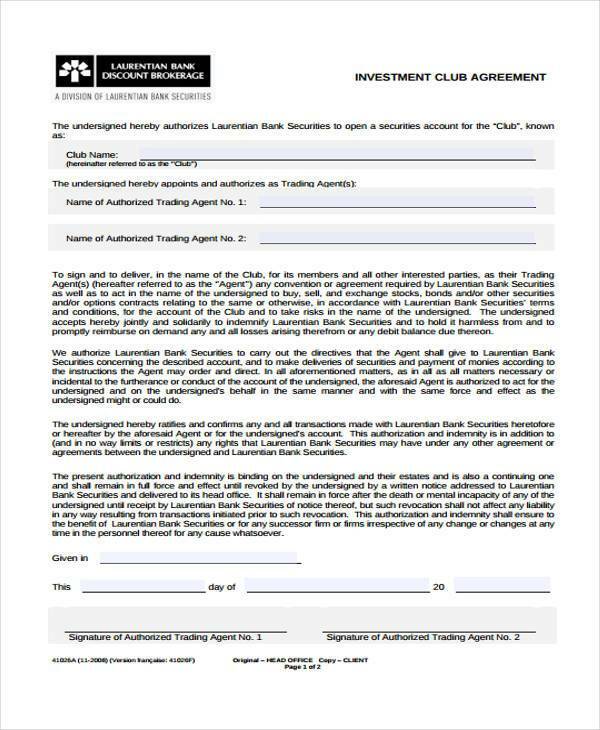 Some investment clubs are not registered and regulated by the authority. It also varies regarding what the decision of the members and their officers will be for the club’s future. 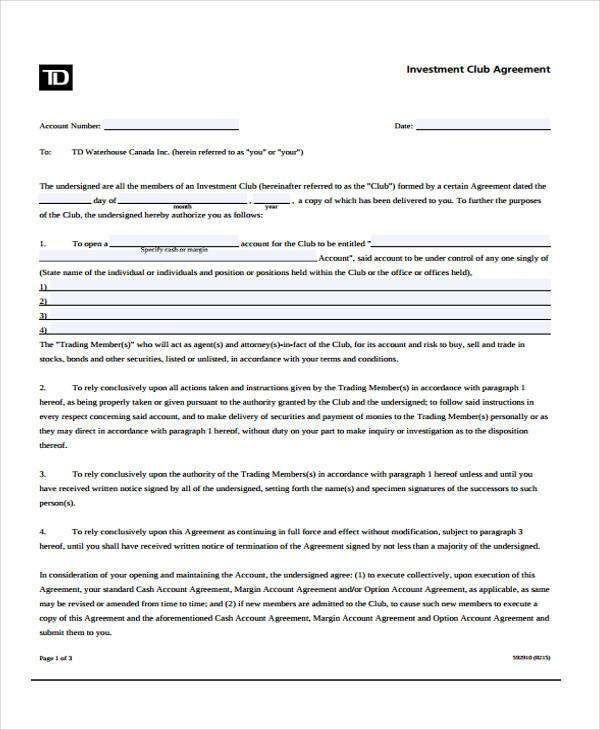 These Investment Club Agreement Forms play a big role for such groups since these documents serve as the basis of a members’ shares. See the samples below for your reference. You may also download these in Word and portable document file formats. Budget-friendly startup. When you are with a group that has been investing a lot, they know how to help you and surely they will compute for your investment contribution. The range of amount varies, sometimes even depending on a member’s age. Profit gain is assured. The contribution you made will be a part of a business that you have been agreeing to and in a few years time, you’ll see the growth of your wealth. Develop camaraderie. It’s not just simple friendships that you’ll get in a club, but friends as well, with the shared goal of growing money. Make a group name. What is a club without a name, right? Just make sure that your group name implies a positive meaning in the world of investments. Write the date. Never forget to include the date in every agreement form that you are about to make. It is important to know the exact date as to when a person became a member of your organization. State the terms. If a person joins a club, he or she needs to attend every meeting that is requested by their officers. 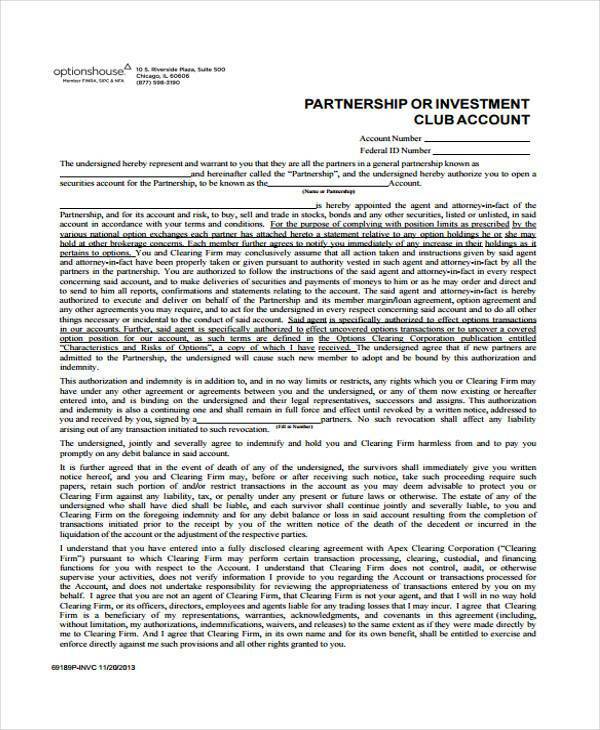 Include in the agreement form the periodic meetings and the organization’s purpose. Specify the contribution. There should be an exact list of ranges for the members to invest monthly. 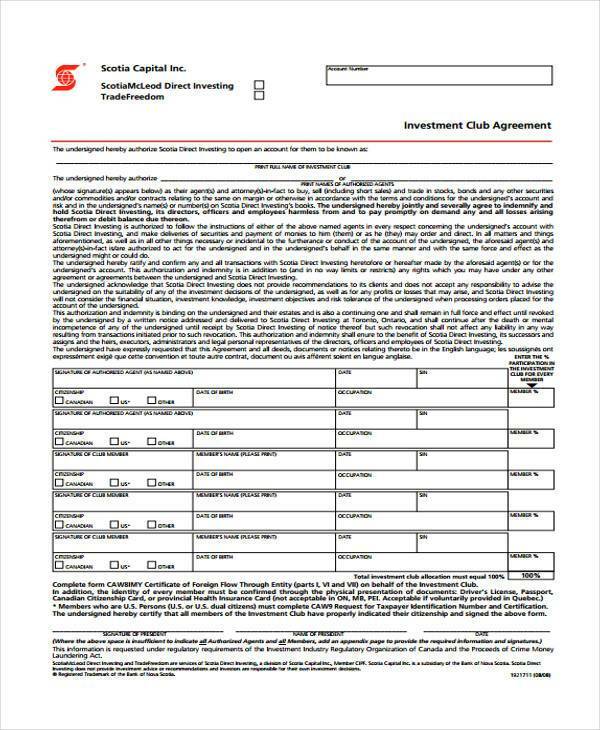 If you are planning to save up to buy a home, make sure you have these House Agreement Forms as well. It serves as your basis for your membership. It is where you will know the amount for your contribution. You will be able to read and go through the terms and conditions of the group. You will know the benefits available. 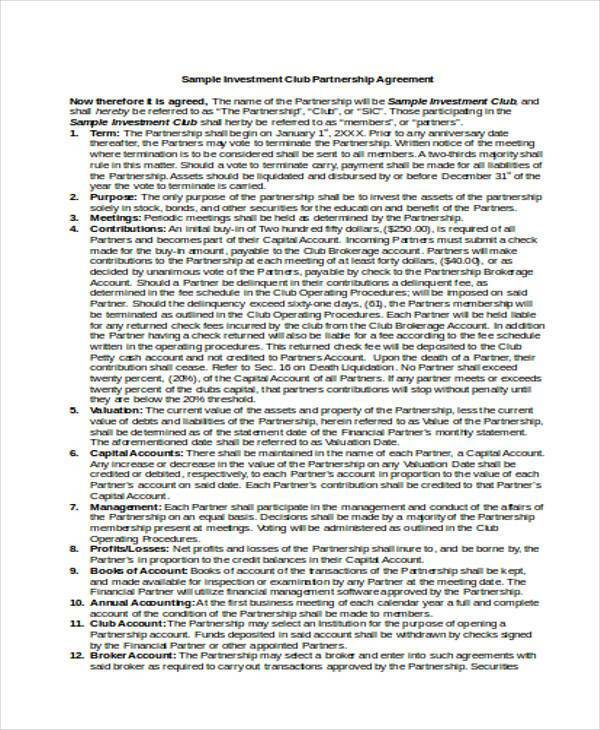 Lastly, it is a signed agreement of you and the head officer of the club, which makes it a legal proof for a case whenever you feel that you are being compromised. With these sample forms on our website, your effort in finding the type of format that suits you will be lesser since we have here the best templates for any legal concerns. 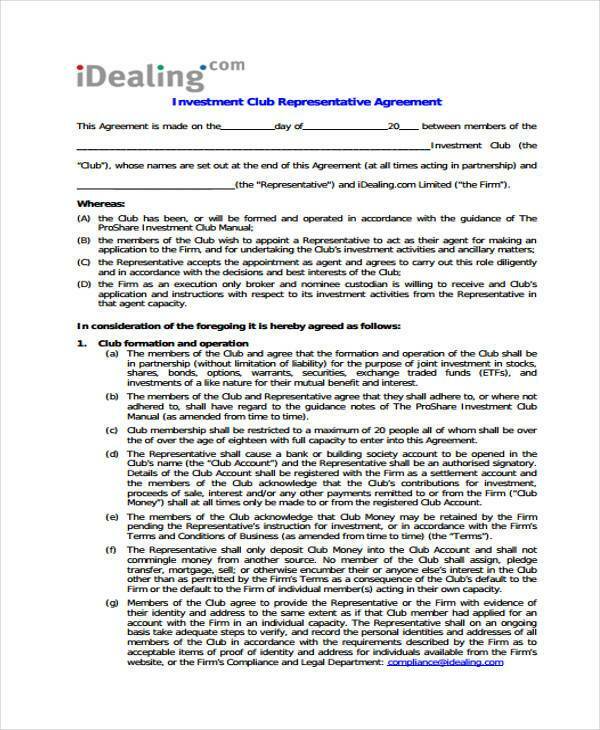 We also have Printable Agreement Forms, so you will be free of hassle when constructing and editing the document’s formats. All that’s left for you to do is to fill up the form with the appropriate information.